Hi! My name is Veronica. Today I’ll tell you about honey extractors. Some people called them honey centrifuge or honey spinners – but the essence is the same. 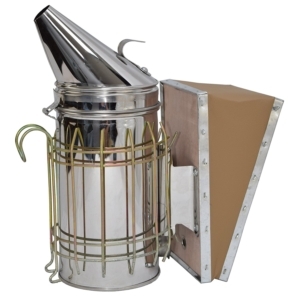 If you are fortunate enough to have a honey surplus, you will need extracting equipment and suitable premises. The first you can buy, but new it will be quite expensive. Many beekeeping associations loan out equipment and this will suffice until you decide whether to buy your own. A rule of thumb for deciding how many containers you will need is the knowledge that a ‘full’ super holds around 9kg (20lb) of honey. Honey extractors come in two types: tangential and radial. Make sure the one you choose accommodates the frames you are using. This has a rectangular cage rotating on a central spindle inside the barrel. Frames are placed against the flat sides of the cage and liquid honey is thrown from the outer face only. Honey on the inside face stays put so the frames have to be turned vertically to extract it in the second stage. Place the frames in the cage so that the top bar leads the direction of rotation. Don’t completely empty the outer cells to start with because then only soft wax supports the honey in the inner cells. Rotate the cage until the outer cells are An alternative to slicing off the cappings with a knife is to lift them off or scratch them open with the tines of an uncapping fork. partly emptied. Turn the frames vertically, replace them in the cage, and start to extract the honey from the other side. Repeat this as necessary until you have emptied both sides of the combs. 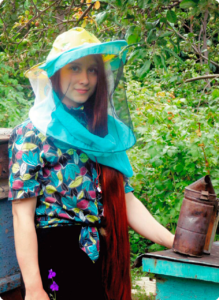 Honey is thrown out, hits the side wall and runs down into a collecting well at the bottom. Run off the honey into jars or buckets. Tangential extractors are usually small, holding up to six frames, and handpowered as the cage does not need to be rotated very quickly. Turning the cage too fast can break up the combs and you will have to filter the bits from the honey, and you will also have lost valuable drawn comb. 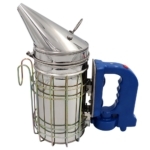 Most tangential extractors are hand cranked as the cage does not have to be rotated very quickly. The cage in a radial extractor holds the frames along the radii like the spokes of a wheel, with the top bars at the outside. As the cage rotates, the top bars move faster than the bottom bars and suction lifts the honey out of the cells on both sides of the frame at once. It hits the wall and runs down into the collecting well. Most small-scale beekeepers will use a radial extractor that takes 9, 15 or 20 frames. They can be hand- or motor-powered. If yours is motor-driven, build up the speed gradually so that the extractor can get ‘balanced’. In the radial extractor, frames are placed with the top bars outermost. Honey is extracted from both sides of the comb at once. You will need to uncap the honey cells with a sharp or serrated knife. One with a long slim blade of at least 20cm (8 inches) works best ‒ a blade longer than the frame depth makes uncapping easier. You will also need a clean plastic washing-up bowl and a length of wood some 4–5cm wide and long enough to span the bowl, resting on the edges. Cut a notch at each end large enough to fit over the bowl’s rim to hold it stable, and cut a recess in the opposite surface wide enough to take the frame lug. Place the bowl on a firm table covered with plastic sheet or newspaper to catch the drips. Put the support across the bowl and stand the frame lug in the recess. Then cut off the cappings, moving the knife either upwards or downwards – you decide which suits you best, but be careful the knife doesn’t slip if you cut upwards! Slice just under the cappings. Angle the frame so that they fall away into the bowl. At this stage, you can even up any irregular comb surfaces. Don’t worry if this means cutting quite a bit off the cells, or if you damage the comb. Sometimes lumps will be pulled off, even down to the mid-rib. The bees will repair the comb next year, and you can recover the wax and honey from the bowl. Alternatively, you can lift off the cappings using the tines of an uncapping fork, or you can scratch them open using the points. As you do so, jiggle the fork from side to side, leaving behind a trail of broken cappings. Honey will come out of the cells, but you will also get small pieces of wax which have to be filtered out later. 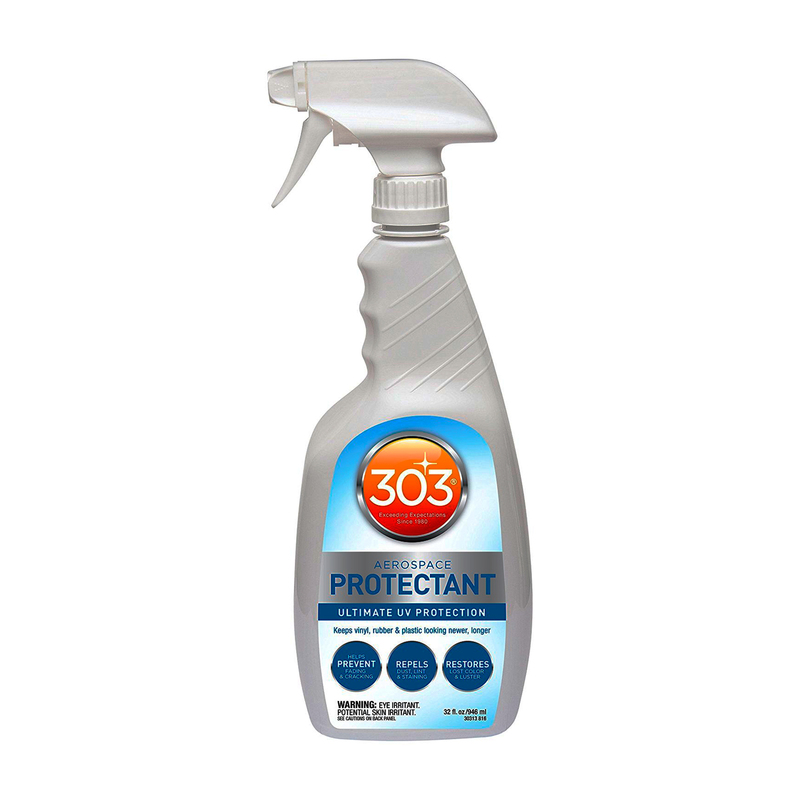 Although not a listed use, you can remove just the cappings with a hot-air paint stripper! Blow the hot air quickly over the surface of the comb and the cappings will simply melt and disappear. The honey doesn’t get hot, the comb is not damaged, and the frames can be put straight into the extractor. Any uneven surfaces can be leveled off the following year before the combs go back to the bees. When uncapping full super frames, take the opportunity to level the comb surface with the frame woodwork. An alternative to slicing off the cappings with a knife is to lift them off or scratch them open with the tines of an uncapping fork. Try to balance the frames in the extractor, i.e. load ones of similar weight in a batch, or opposite each other in the case of a radial extractor. When you start rotating the cage, the extractor will begin to move around on its legs until some of the honey is extracted and the weight inside is evenly balanced. Then it can settle down. Many years ago I was given a tip which I was convinced would not work – until I tried it. When the extractor starts wobbling, your first reaction is to grab it and try to hold it still. This puts a big strain on the barrel, which is trying to move in the opposite direction from the cage. The advice I was given removes this strain. Fix some fairly substantial timber into a ‘T’ shape with the ‘spokes’ sticking out a bit further than the ends of the legs when the extractor stands on them. Attach one strong castor to the end of each spoke of the ‘T’. Screw the bottom of the extractor legs to the three spokes. Then, when you start rotating the cage, allow the extractor to ‘dance’. In due course, the forces will balance and it will settle down to a gentle wiggle. Initially, you may have to restrain it ‒ I once had to tie one to a table leg to stop it waltzing off down the room! Don’t be tempted to run the extractor too fast or for too long. Getting out the last drops of honey will be at the expense of adding fine air bubbles to the liquid. Remove the frames from the extractor and return them to the super(s). You can take the ‘wet’ supers back to the apiary in the evening and place them on top of the hives, over the inner cover with the feed hole open with the roof on top. It is preferable to return supers to the colonies they came from unless you are absolutely sure you have no disease in your apiary. Bees will get very excited at this sudden bounty but this will be reduced at night. By morning things will have calmed down and the risk of robbing will be greatly reduced. Within a week, all the remaining drops of honey will have been removed by the bees. Any bees still in the supers can be removed using a Porter bee escape in the feed hole. Once cleared you can remove the supers for winter storage. This type of ‘honey gate’ ensures that you do not get leaks from the tap. It can be tightened when not in use. Run off the honey from the well in the extractor before it reaches a level that fouls the bottom of the cage. You can either filter and bottle it, or run it into buckets and deal with it later. 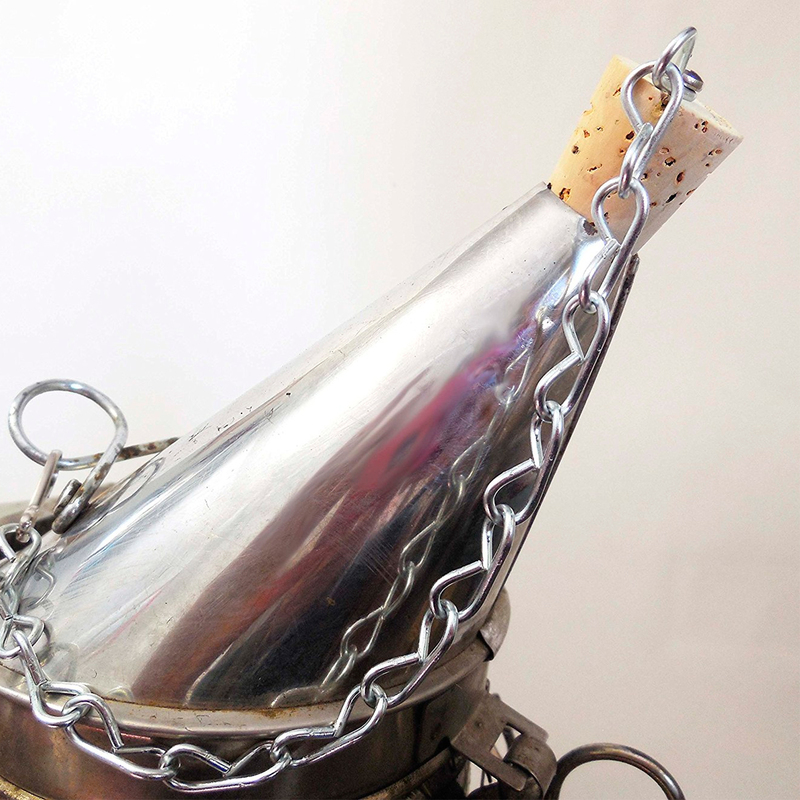 If the latter, it can be coarse filtered using a conical tap strainer, or a double strainer where the coarse bits are filtered at the top and the small bits removed at the bottom. Be warned; do not leave honey running out of a tap unattended. It flows silently, and most beekeepers have a tale to tell of how honey got all over the floor. I knew a beekeeper in this situation ‒ he had two Airedale terriers who obliged by licking it up! 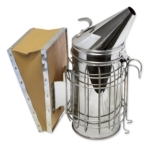 This small conical strainer hangs from the tap and filters relatively large bits of wax etc. from the honey. Its size and shape mean it can clog up quickly. Clean it before this happens or you will be waiting a long time for it to empty. Honey is a food and, as such, if you want to sell it, is subject to legislation. This can change so it is best to check on the Internet for the latest version. Details are available on the Food Standards Agency website (www.food.gov.uk), and there are some helpful notes at www. beekeeping.org.uk/food_safety.pdf. 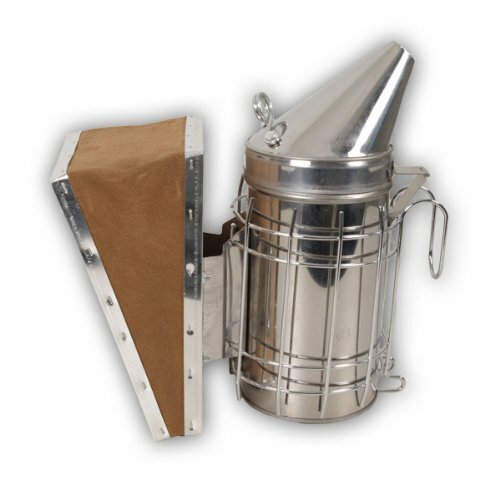 Extract your honey in clean and hygienic conditions. For a few colonies, the kitchen is fine. You must have two sources of water; one for washing hands and equipment, the other for washing the floor. Arrange things so you can move easily from one task to another. Try to transfer dripping combs over the equipment. As things get sticky, wash them before you spread honey to every surface you touch. Wipe honey from the floor with a just-damp rather than a wet cloth, which actually spreads it into a larger, sticky patch. Try to arrange the stages in a circle around where you will stand. Start with the sink and then have the pile of full supers. Next is the uncapping station, then the extractor, followed by a place to pile up the empty supers which receive the extracted frames, ready to go back to the bees. Many beekeeping associations loan out equipment and this will suffice until you decide whether to buy your own. A rule of thumb for deciding how many containers you will need is the knowledge that a ‘full’ super holds around 20lb (9kg) of honey. 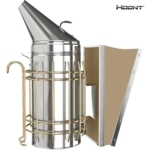 5 How to choose honey extractor? 12 How to light bee smoker? 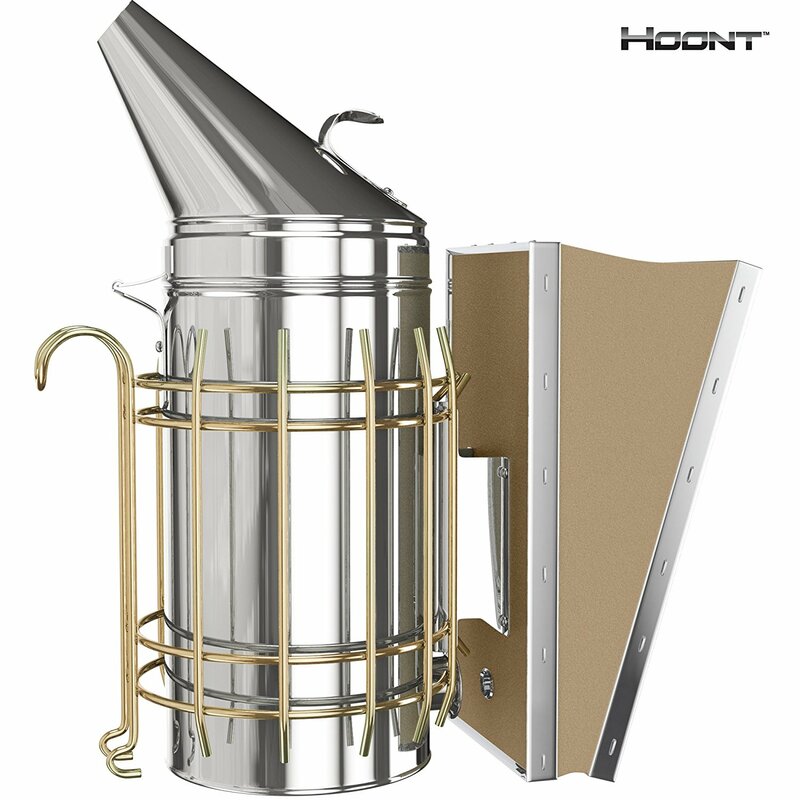 How to choose honey extractor? The second important point is the operation type. Hand-driven, or manual honey extractors are convenient for a small amount of extracted honey or if there is no access to the energy source (electricity or battery). Electric, or motorized honey extractors allow saving time and effort. 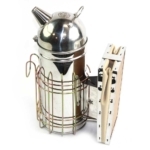 What bee smoker fuel to choose? I really like pine needles. They smell pretty good when they’re burning and I usually keep a bag of these in a greenhouse which keeps them nice and dry. If your fuel is damp, you’re going to constantly have trouble keeping this thing lit. 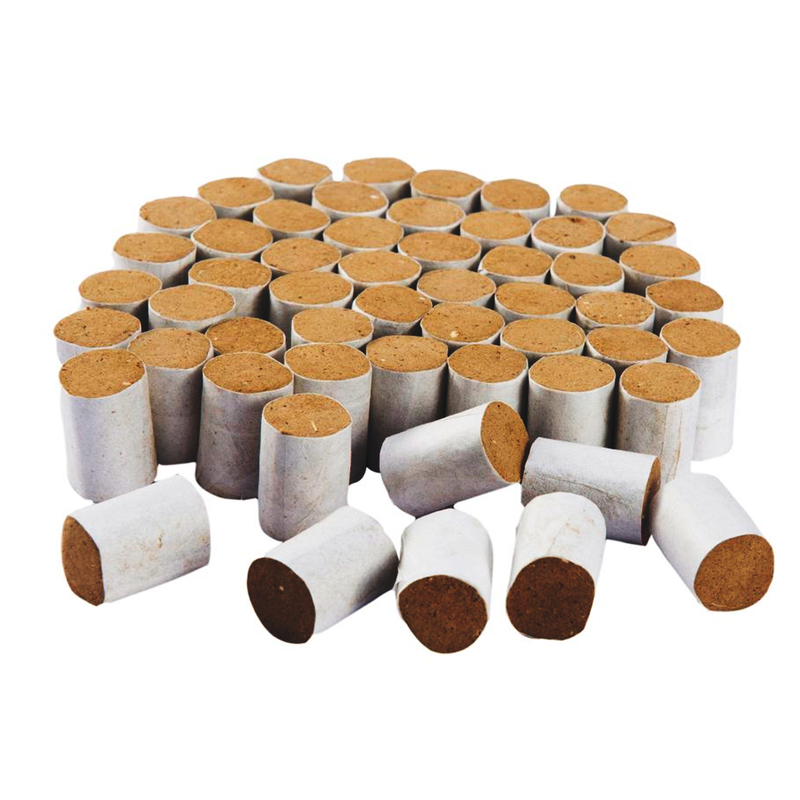 There are also commercial smoker fuels like compressed cotton pellets. They work fine. They don’t smell as nice as pine needles, but there’s a host of fuels. 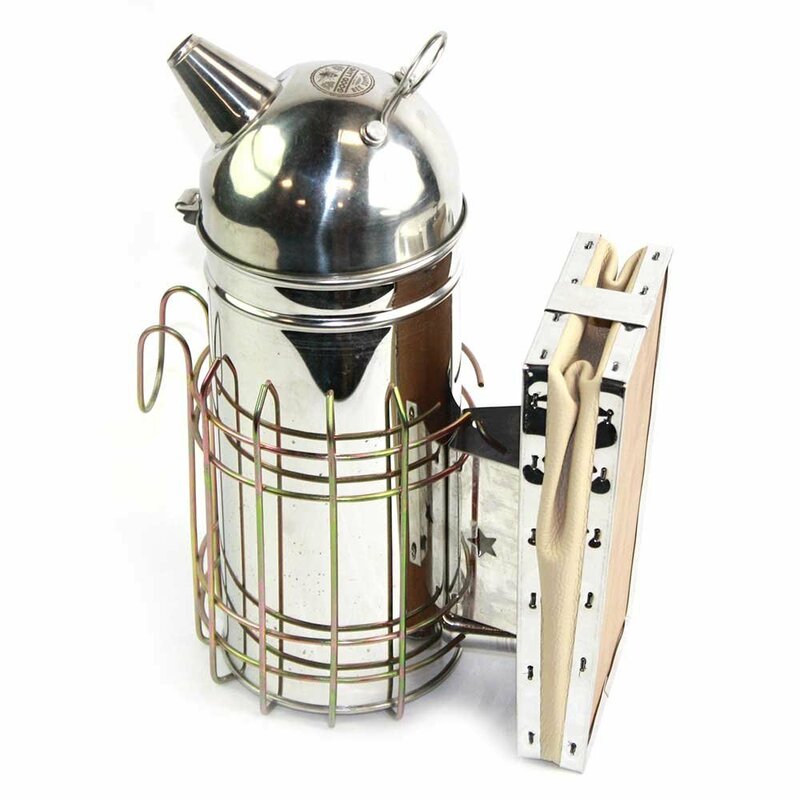 As for me, best bee smoker fuel is the one from Mann Lake – start fast, lit long, no need to use additional materials. But anyway you can use a lot of different natural materials, wood pellets, all kinds of things. One Mann Lake pallet would be enough to smoke one hive. 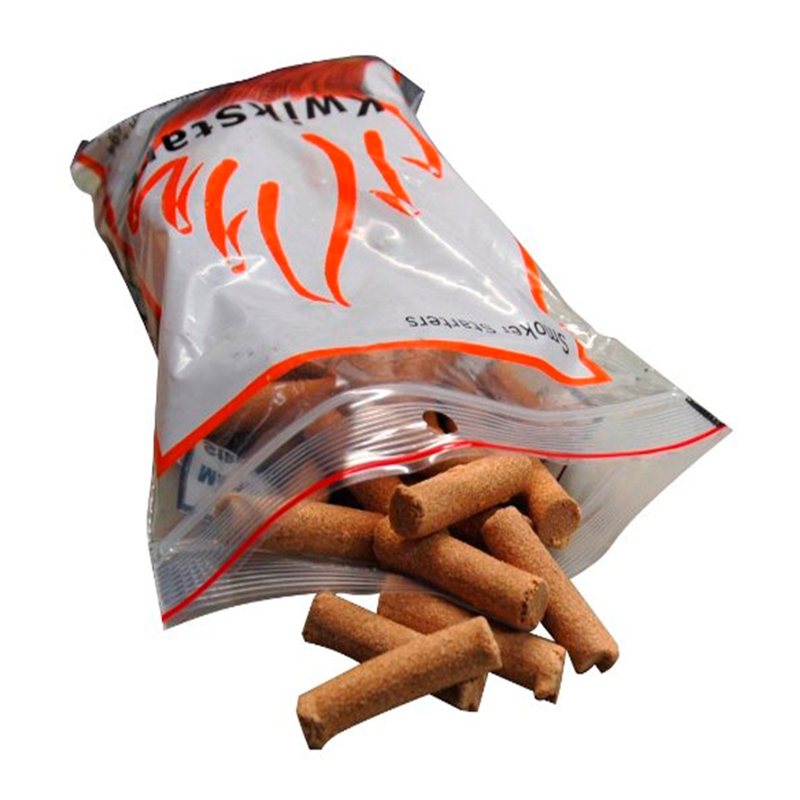 Excellent cope with its task – the smoke occurs immediately and in sufficient amount. 100 pieces in the set. The most efficient fuel, as for me. Love it because of great smell. 54 pieces in the set. 1 pellet is enough for 25-30 minutes of lit and for inspecting 1-2 hives. 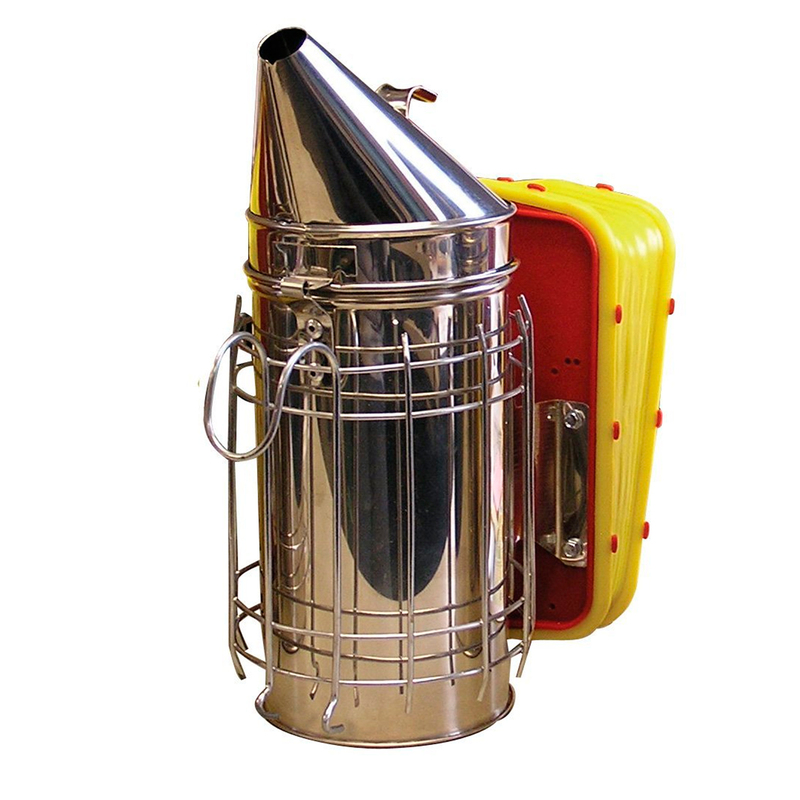 How to light bee smoker? I start with a little fuel in the bottom and I light that fuel and I want to puff that until I see flames coming up. Get that burning really well and then I’ll lightly stuff a little more on top. Now we’re starting to get smoke. I’m using the bellows to get that burning. Our goal is to have the ember in the bottom. That’s where our heat is and then a smoldering fire down there. Then as the smoke filters through all this fuel, it cools. It has time to cool. We don’t want to be blowing hot, fiery smoke on our bees. We want cool smoke. So as that gets burning I add more fuel, and this thick, white smoke is what we’re after. This is what’s really going to help us work our bees. So I pack that down, give it a few more puffs. When you initially light it, a lot of times folks put fuel in too quickly and they put the smoker out, so make sure you continue to get that nice thick, white smoke coming and once I feel like I’ve really got it burning good in the bottom, I’ll go ahead and pile in a nice big handful, pack it down. Sometimes I’m working bees for several hours so I want a lot of fuel in there. So now we’ve got our heat in the bottom, and you can test that smoke on your hand. It’s very cool. We don’t want to be throwing flames and sparks on your bees, burning their wings and such. They won’t appreciate that very much. We just clouded up a little bit but if there’s thunder in the distance sometimes bees react to that. They’ll be more aggressive and more sensitive. They’re very sensitive the barometric pressure so they know when the storm’s coming way before we do and you’ll watch like… I might not have any sense that there’s a storm and there will be large numbers of bees coming back to the hive and very few leaving and then 15-20 minutes later, a big cloud comes over the mountain, starts rumbling, the bees knew that way before I did because they sense that change in barometric pressure… Pretty cool stuff but they’re also a little more potentially aggressive when there’s an approaching storm. Also, you know, during the middle of the day when its hottest might not be when you want to get in your bees but you want to get in your bees during that time a day because most of the foragers are out in the field. The foragers are your old, grouchy bees, so the less of those that are available in the hive, the easier time you’re going have worked your hive. If you get in there at the crack of dawn when everybody’s home, you have a lot more bees to get upset at you. Same thing if you wait till near dark you have a lot more trouble too so when the peak foraging time is, say between 10 a.m. and 4-5 p.m. is the best opportunity to get in the bees. You’re working with their time schedule a little better that way. In the end I want to say just a couple of words. Remember, even the best bee smoker does not replace intuition and experience. Learn your bees – it’s main rule. Wish you successful inspections!